The Everest base camp trek is awesome. Everest base camp trek route follows the footsteps of Edmund Hillary and Tenzing Sherpa and ends with an ascent at Kala Patthar. Kalapatthar known as mountain black stone, is a hill station locates at an altitude in 18,205 feet is a little peak. It is one of the best famous hill stations to observe Mount Everest, Cho Oyu, Nupse, Amadablam, Cholatse, Tabuche and Makalu summit with many other tallest mountains in a horizon. Trek everest base camp elevation is about 17,650 feet above sea. See about mount everest facts to find the best Everest Base Camp Trek in Nepal, and get the most well-known trek in the world with spectacular scenery around some of the highest mountains. Use our expertise to make your trek to Everest basecamp. Along the Everest Trek, you can view the tallest Mountains, brilliant landscapes, the high mountain villages, and Buddhist monasteries. Furthermore, the Everest base camp trek 12 days has a great opportunity to experience the local sherpa hospitality staying at their modern lodges. Look at the everest base camp trek blog to recognize the Sagarmatha national park, listed in UNESCO world heritage sites in Nepal. Base camp Everest trek is best to see the highest mountain in the world, Everest at 8,848m, and many of the world’s 8,000-meter peaks such as Lhotse, Cho Oyu, and Makalu. Everest Icefall glacier with huge ice pinnacles soaring to unbelievable height before reaching to Basecamp. Base camp Everest trek will conduct after flying to Lukla, so the most beautiful highlights of this trek is a scenic mountain flight from Kathmandu – lukla – Kathmandu sector. Roughly thirty-five minutes short flight journey to Lukla or return is thrilling and adventurous. The Everest Base Camp Trek takes you with the well known Sherpa settlements. It incorporates Namche Bazaar, Pangboche and Dingboche villages. As such, you will also experience the flora and fauna of Sagarmatha National Park. Furthermore, the visit to the Everest View Hotel is like a dream of travelers. You can visit also Khumjung village during your hike to Sengboche Hill station. Sengeboche hilltop offers also a tremendous mountain view such as Mount Everest (8,848m), Lhotse (8,516m. )Tawoche, Amadablam, Island peak, Cholatse and many other tallest mountains in 360 deg. angle in a row. In addition, Visiting Tengboche Monastery is another attraction of everest visitors. When people are traveling to basecamp, they also like to visit the monastery for bless for trip succession. Similarly, the Everest Base Camp Trek additionally incorporates the ultimate viewpoint of Kalapatthar. As you are standing at the hilltop, you will have the best panorama display of all the mountains including Mount Everest massif. Essentially, The Khumbu Glacier and the Icefall are likewise a few places that are strikingly acclaimed around there. In the end, you will appreciate visiting the base of the world’s tallest mountain. How is the Everest base camp trek difficulty?. Despite the tough Himalayan landscape of the Khumbu valley, it has got a moderate excursion reviewing. As Khumbu’s Landscape comprises of slopes and level grounds, you will, for the most part, do up-slope and down-slope trekking in moderately level terrains. It helps you adequate acclimatization time. Read about everest base camp climb and everest base camp trek reviews in the internet forum. Get your guide for Everest base camp trek map in the blog post and ready to choose the lowest Everest base camp trek cost. The trek is reasonable for any walker searching for something somewhat more difficult and vigorous. A few explorers get the lower region of mount Everest rapidly by Everest Base Camp Helicopter Tour or mount Everest helicopter visit but since of lack of oxygen and absence of proper acclimation, the proportion of everest base camp trek deaths is getting higher since couple of years. Our program dependably incorporates rest days and develop bit by bit, so as to adapt to the height. Along the Everest base camp climbing, you can stroll at your very own pace, with a lot of stops for rest. Perhaps there some questions like how long does it take to do the Everest Base Camp Trek?, How much does it cost to climb Mount Everest base camp?. Moreover, how cold does it get at Everest Base Camp? or What is the best time to visit Everest Base Camp?. Trek to Everest base camp is possible to do in any time throughout the year. Hike to Everest Base Camp is conceivable to finish inside 12 days as an ordinary plan. You can likewise add 1 day to make it as an unwind and agreeable trek. Previously mentioned Everest Base Camp climbing is contrasting with most strolls in Khumbu locale paving the way to the base camp. The specific course is intended for world explorers who wish to climb to the base camp of the tremendous mountain however are limited time-wise. For voyagers who wish to achieve the Everest base-camp in a progressively loosened up way can attempt this agenda nonetheless if this schedule isn’t fit you then send us a request for customized itinerary. We take early departure from Kathmandu to Lukla, Tenzing– Hillary Airport. Breakfast at lodging and overseeing team, stroll to Phakding village. We trek along the limited valley of dudh Koshi following a delicate climb up the mountainside on the left bank of the Dudh Koshi stream. Nupla (5885m) top is only alongside you on the contrary waterway banks. We pass a few minor Sherpa towns, cabins, for example, Ghat, Phakding, Tok lastly we reach Bengkar village. The trail moves from the riverbed on the left bank into the mountain side. We proceed with the trail with many high points and low points; cross a stream, and go by the modest town Monjo. We at that point come to Sagarmatha National Park office where a recreation center extra charge needs to pay. Furthermore, we pursue a short stroll along the riverbed of this valley where the significant waterway meets one another. Traverse the Hillary connect, the trek starts soak rising to Namche Bazar, Sherpa settlement of Solu Khumbu. In transit, we would have great perspectives of Mount Everest (8,848m), Lhotse (8,516m.) and Kwangde. Encompassed on three sides by mountain ranges, Namche Bazar is a focal center point of the territory for nourishment, trekking gears and other essential goods. Day 4 Syangeboche hill station hiking to get best view in 360 deg angle. Hike to Syangeboche slope station, a perfect spot for acclimatization to the high height before heading towards Sengboche Hill. We go up to Khhumjung cloister (one of the greatest sherpa occupants) disregarding Syangeboche slope station. While you are climbing through Syangeboche slope station, you will have an astounding perspective of Mount Everest, Mount Ama Dablam, Mount Thamserku, Mount Nuptse, Mount Lhotse, Mount Tawche, Mount Kwangde, etc from here. On your returning, we can visit the Museum simply over the town that displays Sherpa culture. Having breakfast, we continue our journey to Tengboche Monastery / hill station. The trail goes ahead leaving a steep cliff dropping down the Dudh Kosi river. From here you have a panoramic view of Ama Dablam (6,812m), Everest, Lhotse, Nuptse (7855m) and Tawoche (6,501m) mountain. We would visit Trashinga, Phunki Tenga and then reach Tengboche Monastery. Tengboche hill offers a good view of sunrise and sunset at Everest combine with Ama Dablam at right. Leaving at Tyangboche hill at the backdrop, we descend through a rhododendron forest and enter Deboche. Deboche is tiny village with stays about four nice lodges. Crossing a suspension bridge at Imja River (commonly known as Khola in Nepali), we head towards Minlinggo and inter Imjatse Valley beneath the majestic peaks of Ama Dablam, Nuptse, and Lhotse. We finally reach at Dingboche village where we stay overnight. Day 7Acclimatization at Dingboche ! Roughly about 4 hours hike to Nagarjuna peak 16,000 feet. Today, we acclimatize at Dingboche to be familiar with the local climate. Today, we hike to Nagarjuna peak located at an altitude of 16,000 feet for better acclimatization. Nagarjuna hill station offers an outstanding view almost the complete the Khumbu mountains including mount Makalu. It’s not tough hiking but as the trail is gently up than it takes a longer time to get the summit. Hike to Chhukung village is optional, it also provides a majestic view of Island peak, Ama Dablam, Makalu, Tawoche peak and others. In the late afternoon, we return at our lodge at Dingboche and take a rest. Having breakfast at Lobuche, we trek to Everest Base Camp from Gorakshep. It is justa a day hiking. The journey today is the most rewarding section of the complete Everest base camp. Our trail winds up through the rocky path and Khumbu glacier. The view of Nuptse, Lho-La, and Khumbutse appear at a stone throwing distance. Visit Everest Base Camp and come back to Gorakshep. We trek from Gorakshep to Kala Patthar hill station hiking. Kalapatthar is a mountain black stone locates at an altitude on 5,545m/18,132 ft, one of our highest footsteps of the complete journey. Kalapatthar or Kalapattar is famous hill station for watching sunrise and sunset on Everest Himalayan range. You will have an amazing view of Mount Everest, Mt. Pumori, mt Lingtren, mt Khumbetse, mount Nuptse, mount Lhotse, Mt. Ama Dablam, Mt. Thamserku and many more from Kala Patthar. After taking photographs, we descend downhill walking to Gorekshep, sandy ground and meet the entire Nepali crew to descend Pheriche. Himalayan Rescue Association Aid Post (HRA Aid post) is available at Pheriche health post where foreign volunteer doctors are providing medical treatment. Walk to Tengboche hill, located above rhododendron forest, famous for the oldest monastery of Everest. From the monastery, one can enjoy the splendid view of Ama Dablam, green hills, and pristine river. Trek descends from Tyangboche to Namche Bazaar (3440 m ) passing several tiny villages. Sanasa and Lagusasa are the most typical tiny village. You will catch the way descends from Gokyo valley. Finally, we come to Namche Bazaar in the late afternoon. It is not the tough but a long day of Everest hiking. We trek downhill to Lukla with the same trail like we use on our ascend. It is the last day of our trekking. Upon arrival at Lukla, we would get refreshed and take a rest. Day 13Scenic mountain flight back to Kathmandu. Early morning, we take a breakfast. Our guide will check the flight status with the weather. We board our early flight to Kathmandu. Upon arrival at Tribhuwan International Airport (TIA), our guide will arrange a private vehicle to transfer to your hotel. In the afternoon, go shopping or request your guide to discover Kathmandu as his whole day salary is paid in the package price. Additionally, if you wish to visit the world heritage sites in Kathmandu with expert tourist guide in additional cost?. How much Everest base camp trek cost? The Everest Base Camp hiking cost is available at USD 1,290 per person is standard trek price on double occupancy basis. But of course, the trip price will vary according to group size. For the deluxe and luxury trekking tour plan, we add 3-star category hotel deluxe air-conditioned room in Kathmandu (BB PLAN) and Tourist standard accommodation with attached bathroom while trekking on possible places. AND WE ARE OPEN TO CUSTOMIZE YOUR TOUR AND PACKAGES PRICE AS PER YOUR REQUIREMENTS. International tour leaders are highly encouraged to get discount and attractive complimentary. We can organize private Everest Base Camp Trek or kalapattar combine with ebc starting at any date that works for you. Please contact us for more information. Question: What is Mount Everest and where is Mount Everest located? Answer: Mount Everest, is a big rock of granite. It is the top first tallest mountain on Earth. Mt. Everest is located in the Mahalangur range of the Great Himalayas. The mount Everest reises up exactly on the borderline of Nepal and Tibet (27°59′ North latitude, 86°55′ East longitudes) in the southern part of Asia. 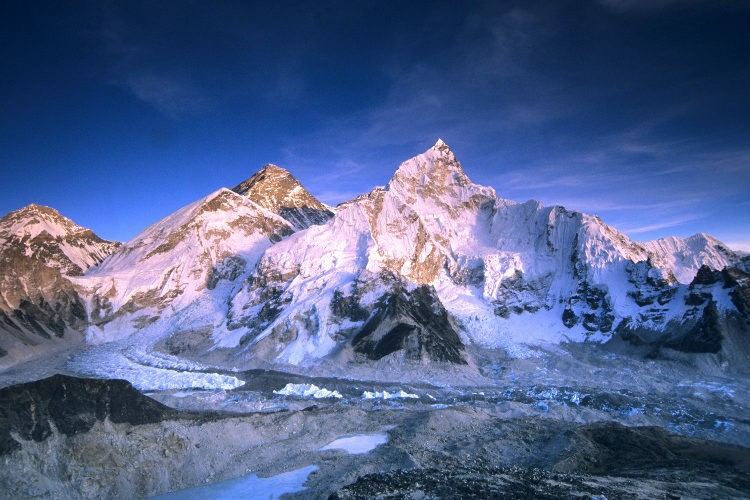 Mount Everest is commonly known as Sagarmatha in Nepali. Question: Is pick up service of my Everest trek available in my arrival day in Kathmandu? Answer: Yes sure. If you provide us your flights details then you should do request. Our representative will come to pick up you on Kathmandu international airport to transfer you to your hotel. Question: Do I need experience for Everest Base Camp lodge trek? Question: What kind of accommodation can I expect on Mount Everest basecamp trekking? Answer: We provide you with tourist standard accommodation in Kathmandu and in base camp trek routes. The rooms are clean with a cozy bed with a nice mattress. They don’t provide you blankets, so we suggest you to rent a four season sleeping bags for yourself while you are in Kathmandu. Question: What kind of food can I expect in base camp everest trek? The dinner and breakfast are providing in the same lodge you spend the night every day and Lunch will be provided in between the next camp where you go. Question: What opportunities will I have for a shower along Everest base camp hiking? Question: How do I get drinking water on Everest Base Camp Trek? Question: Is it possible to stay overnight at base camp? What would be the options? Answer: Yes, it is possible to stay overnight at Everest Base Camp on your journey on your own cost. Actually, we do have another itinerary to make this happen to stay overnight at Everest Base Camp. Staying overnight at base camp is recommended during the spring season, in May and June months, as you get the chance to meet the world-class Everest climbers and the base camp is colorful and crowded at night. Answer: Travel insurance is mandatory before joining any trips with us, and you need to get your travel insurance policy before joining your trips to Nepal. Your travel insurance must cover the helicopter rescue up to 6000 meters altitude. It comes in handy during medical emergencies and contingency situations. It is recommended to get it from your home country. In case you haven’t bought travel insurance after arriving at Kathmandu; we can help you get one. Answer: You should never walk too quickly too high ignoring your body symptoms. Proper altitude acclimatization is the best way to prevent high-altitude sickness. Listen to your body, trek gradually enjoying the best of culture and nature while giving enough time for your body to adapt to the changing atmosphere. Drink a lot of fluid & keep your body hydrated. If symptoms like a headache, difficulty in breathing and other occurs then descend to a lower altitude. And taken to the hospital if there is any chance. Otherwise, if the condition goes critical then you will be airlifted to the hospital in Kathmandu. Of course the guest must pay the bills. Answer: Everest Base Camp weather is uncertain which we cannot predict. Therefore, the rate of fight delay and cancellation is high at Lukla. If this happens then you will be boarded on the flight tomorrow and you have to spend an extra night at Lukla (if you are returning Ktm) at Ktm (if you are going Lukla). Helicopter rescue can also be used, that depends upon the situation. So, we recommend you to allocate a couple of extra days after your Everest trek, so that you will not miss your international flight back. Answer: The best-recommended way to go for any Everest trek is to board a Kathmandu-Lukla 33 minutes scenic mountain flight. Another available option is to drive from Kathmandu to Phaplu (12 hours’ full day drive) and trek for 2 days more than plan just to reach Chaurikharka. In the present day, there is a local regular jeep service from Kathmandu – Salleri – Kathmandu. Question: Is there any possibilities to explore Everest base camp by helicopter tour? Answer: Yes. If you wish to fly to get higher to the Everest base camp by helicopter then we have special mountain flight tour by helicopter. It departures from Kathmandu every day in the mornings. Answer: Yes. Just buy a local SIM card to get a phone call. You can get telephone services as well as 3G internet services in almost all places. Answer: No. Actually, for trek route, you need to have only cash Nepali rupees because credit cards work only in the bigger cities like in kathmandu. Answer: Because our trips book up months in advance, we recommend booking early to avoid any kind of misunderstanding with Lukla flight timing schedule. But of course, we try our best to make every effort to accommodate last minute bookings. And regarding the deposit, we prefer 20% advance deposit of the total price of the trip in order to confirm your reservation before you arrive in Nepal. And the rest of the payment can be made at the office on your arrival in Kathmandu. Question: Is there any chance to hire a mountain trekking guide and porters? Answer: Yes. If you are not happy to go with our full board package trip then you can still use our service hiring a guide and porters for your hike to Everest base camp. Our expert local sherpa guides will make your holiday the best and lifetime unforgettable. Everest Base Camp Trek Notice ! We booked our trek to everest base camp via Ammar at Gokyo Treks. He booked our flights, organise our trekking permits, and guide. He also advised us how much we would need to spend each day whilst trekking. Whilst we were booking our trek with Ammar we met a guide who had just returned from EBC who told us what to expect.